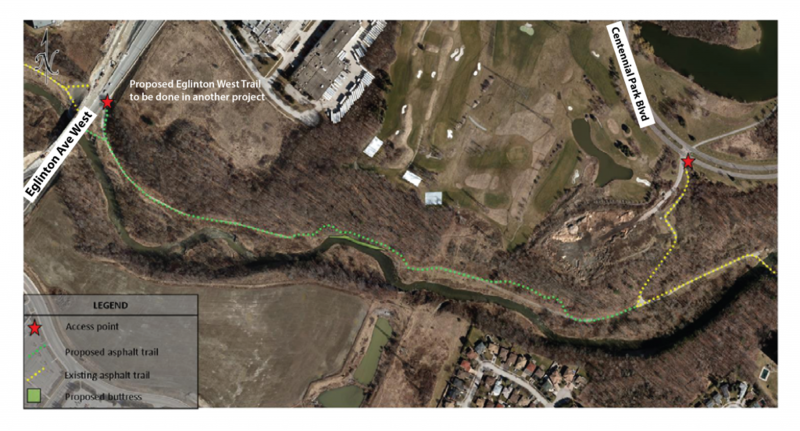 The City of Toronto in partnership with the Toronto and Region Conservation Authority (TRCA) has constructed a new 1.1 km long multi-use trail south of Eglinton Avenue West and parallel to the Etobicoke Creek. This Project is part of the Bikeway Trails Implementation Plan, adopted by Council in 2012. This project formalized an existing granular trail along Etobicoke Creek at Eglinton as part of the Bikeway Trails Implementation Plan, adopted by Council 2012. This project is identified as project 13 – Etobicoke Creek North in the Bikeway Trails Implementation Plan. This new trail connection filled a gap in the Etobicoke Creek Trail and provide a valuable connection along this trail network which extends north to Caledon and south to Lake Ontario. It also provides a key connection to the Eglinton West Trail. What is the purpose of this trail? How does the multi-use trail connect with Centennial Park and Eglinton Ave West? The multi-use trail joins the existing asphalt trail at the southern limit, leading up the hill to Centennial Park Boulevard and continuing into Centennial Park on the other side of the road. The trail also join the eastbound sidewalk along Eglinton Avenue West. Will trail amenities be provided (i.e. signage, lighting)? There will be no amenities along this section of trail. There are a number of amenities in Centennial Park – including (washrooms, parking, etc.). The trail will not be lit or winter maintained. Some areas in the valley are steep. Is the trail accessible for most people? The proposed recreational multi-use trail has been designed to comply with the Accessibility for Ontarians with Disabilities Act (AODA) and the City of Toronto Multi- Use Trail Design Guidelines. The trail will be relatively flat with a maximum grade of 6.8% at only one location at the Eglinton Access. The proposed trail will also be sufficiently wide with an asphalt surface to facilitate use by a variety of users.